Available on DVD (4-Disc) 350 minutes. 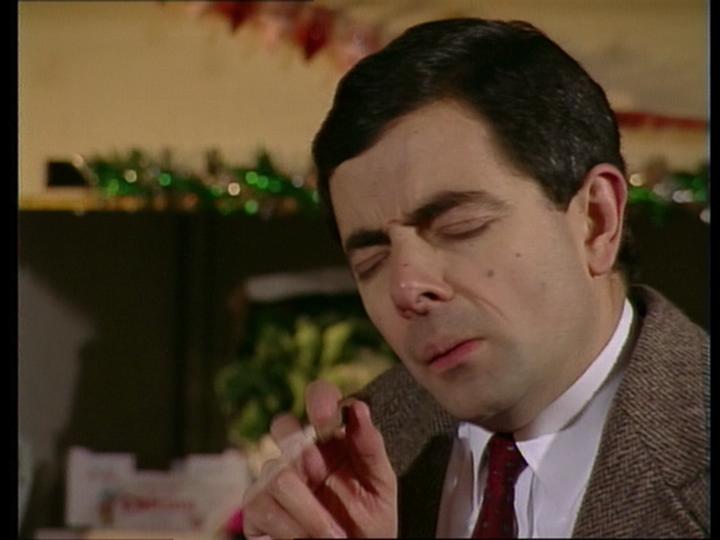 I remember the first time I ever seen Mr. Bean. It was in 1990. Back in the days I was doing tape trading (before the time when programs I wanted to buy where actually available), I received a tape in the mail from a friend with some other programs I wanted but to fill out the tape, he put the first episode of Mr. Bean on it from the UK broadcast. 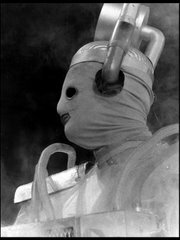 By this point, only the first episode of the series had aired in the UK in January and the next episode wasn’t due until November of that year. It was an odd experience for me to watch it because I was a huge (and I mean HUGE) fan of Rowan Atkinson in the Blackadder series. Seeing Rowan doing physical comedy on this level and not speaking non-stop using intelligent yet cruel quips to disarm someone else (mainly Baldrick) was a bit of a shock to me. It wasn’t until much later that I realized that Rowan made his name by the type of physical comedy that eventually became Mr. Bean. 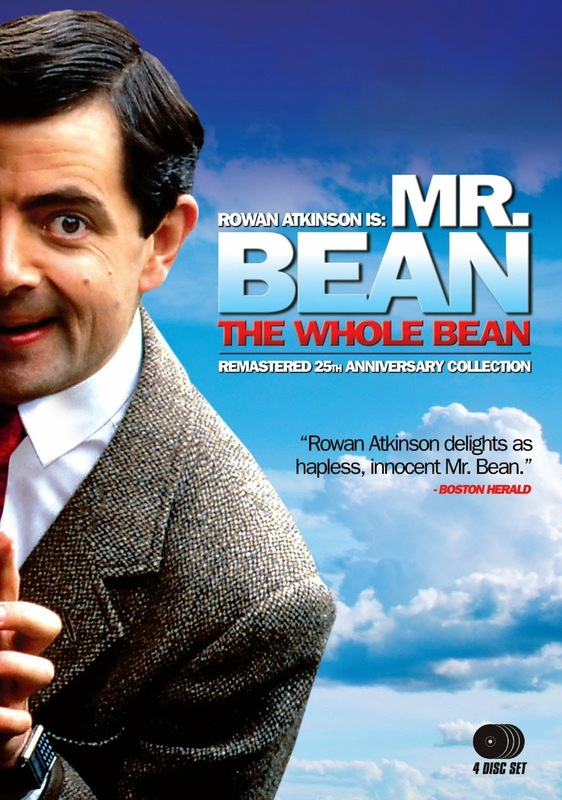 Fabulous Films has released a 25th anniversary collection of Mr. Bean: The Whole Bean. It’s amazing for me to think it has been 25 years since I have seen this character on television but what fun has it been! I may have mentioned it elsewhere but it’s funny how series I religiously followed and re-watched many times over the years suddenly kind of drift away. Mr. Bean would definitely be one of them. As more episodes would become available, we would watch them and enjoy them over and over. The one thing I heard said about Mr. Bean is that it is accessible to everyone. There really isn’t a language barrier because there is not that much language spoken. Bean himself is a quiet person and when he does speak, it is in a very low pitch voice saying very few words. I think the first thing that is obvious about Bean is the well-choreographed physical comedy that comes out of every episode. Bean is actually a very complex character that exists on multiple levels. It would be easy to dismiss him as simple. He can literally be put into any situation. He can be nice to people or downright mean. He can be mischievous or silly. The thing about Mr. Bean is that he is not stupid. He may do stupid things and may try to cut corners to get things done in his own unique way but he is not stupid. We never really know what he does for a living but it is clear that he makes money. He doesn’t live in the slums, he is a middle-class citizen who enjoys doing what you and I would enjoy doing. He takes vacations, he goes on outings to the seaside, likes to enjoy a nice dinner somewhere. It’s just that his way of doing things is very different than how we might go about it which is how we come to the episodes. 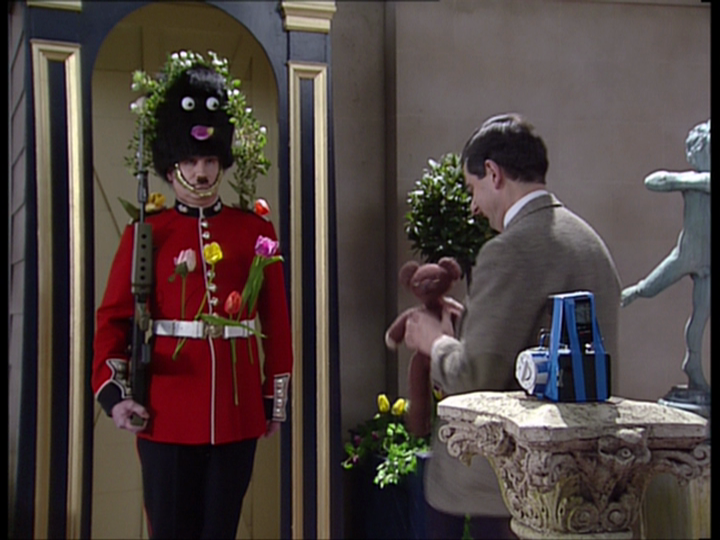 This set includes all 14 episodes of the Mr. Bean TV series produced by Tiger Aspect from 1990 to 1995. Episode 14 was actually never broadcast. Going through the set is like walking down memory lane. So many memories watching this series and thinking how awesome the series was back in the day. So much of this I haven’t seen in years. So many memories stirred up by great comedy moments. It’s always good to see some of my favorites that I watch time and time again. I think the episode I watch the most is Merry Christmas Mr. Bean. This used to be a Christmas morning viewing tradition for me for years. I only stopped watching it because I had simply seen it too many times. 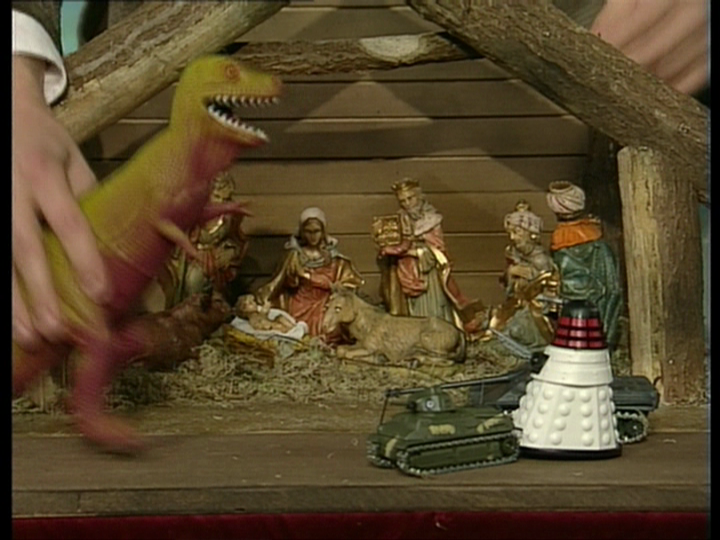 In my personal opinion this is one of the best Christmas episodes of anything, ever. As I write this, it is on in the background now. There are so many iconic moments like (obviously) the turkey on Bean’s head but also nice, fun moments like Mr. Bean taking over the Salvation Army band and conducting a jazz version of God Rest Ye Merry Gentleman. The faces Bean makes to accentuate the musical highlights of the song is wonderful. Every time I watch it, I can’t help but to think of my Dad’s hysterical reaction to watching that scene. He loved it which will bring me to a point a little later in this review. There is standout moment in every episode. Such moments like Bean too afraid to jump off a diving board in The Curse of Mr. Bean or Mr. Bean trying to resuscitate a man who had a heart attack in Mr. Bean Rides Again. There’s great moments like Bean filling his own tooth fillings at the dentist’s office, creating a “paint bomb” to repaint his apartment or his Mini being crushed by a tank. 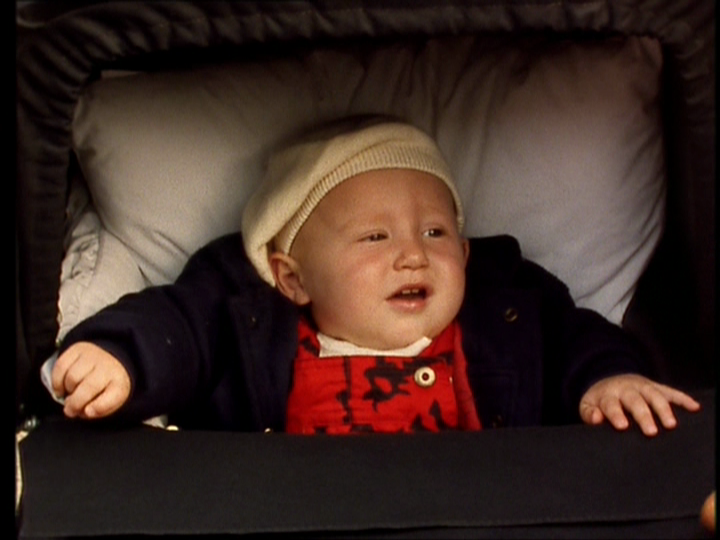 Two of my absolute favorite episodes of the series is Mr. Bean in Room 426 and Mind the Baby, Mr. Bean. 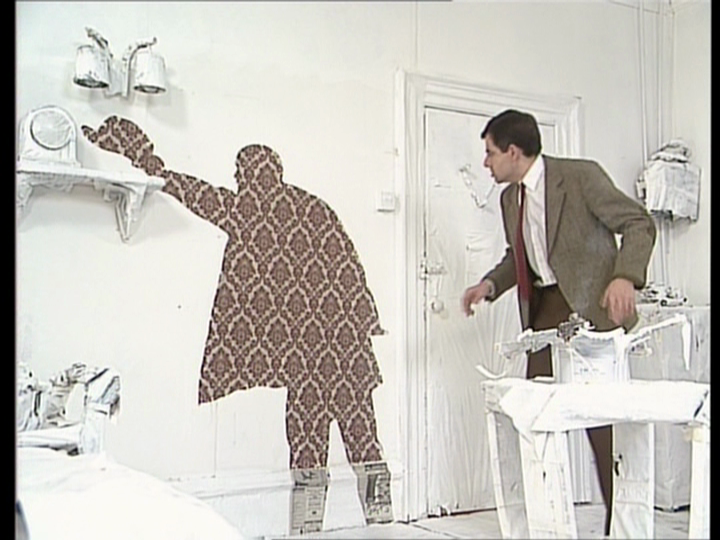 In Mr. Bean in Room 426, like I said, he really is basically like you and I. Who wouldn’t want to treat themselves to a nice stay at a luxurious hotel? Of course, Bean has never been in a nice hotel so we see his astonishment of discovering what a TV remote control is, he has never tipped anyone for bring his bags to his room and “tips” them with a cough drop. For some reason, he is constantly trying to outdo the guest that is staying next door to him. That eventually results in food poisoning for Mr. Bean. Plus any episode of someone trying to impersonate Danny LaRue is alright by me! Mind the Baby Mr. Bean is kind of a touching story of Mr. Bean ending up with a lost baby at an amusement park (of course Mr. bean’s fault) and trying to take care of him. Bean’s unorthodox way of doing things usually gets him into trouble. A favorite moment of mine is watching Bean change the baby’s diaper. The wind takes the soiled diaper from a ride it was sitting on and we see it hit person after person as they are on rides, walking around, etc. It is hilarious. It is potty humor at its best! Both of these episodes benefit from being shot on film. The editing is quick and some of the shots are a lot more cinematic such as a crane shots. It’s nice to have stuff performed in front of a live studio audience but to have these look so good because they were shot on film is nice too. I have always been surprised by the number of known actors who have appeared in the series who have been stars in their own right but seem to have just taken the part because they are “jobbing actors”. These include Richard Briers (The Good Life), Roger Lloyd Pack (Only Fools and Horses), Richard Wilson (One Foot in the Grave), Caroline Quentin (Men Behaving Badly), Christopher Ryan (The Young Ones), and the wonderful Frederick Treves who has been in all sorts of wonderful things. Look him up! 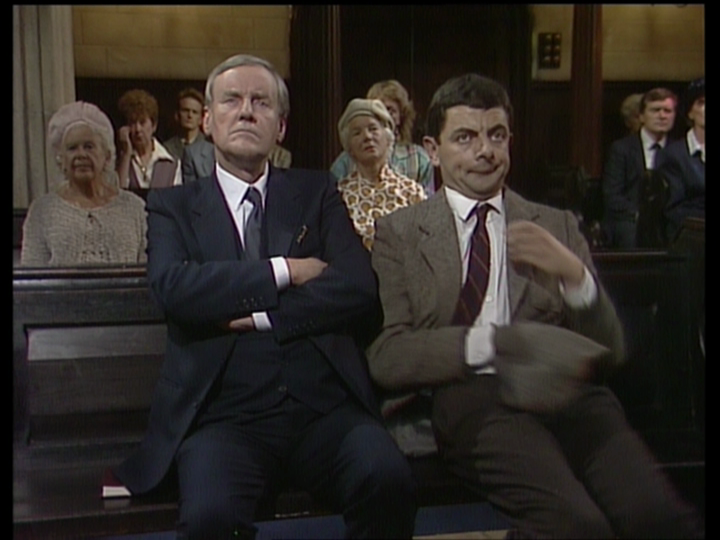 One of the things said about Mr. Bean in one of the extras and above is that he is accessible to everyone. My Dad really did not like British television for whatever reason. Yet, he loved Mr. Bean. My Dad always loved visual gags which there is so much of in the series. Everyone can enjoy Mr. Bean. 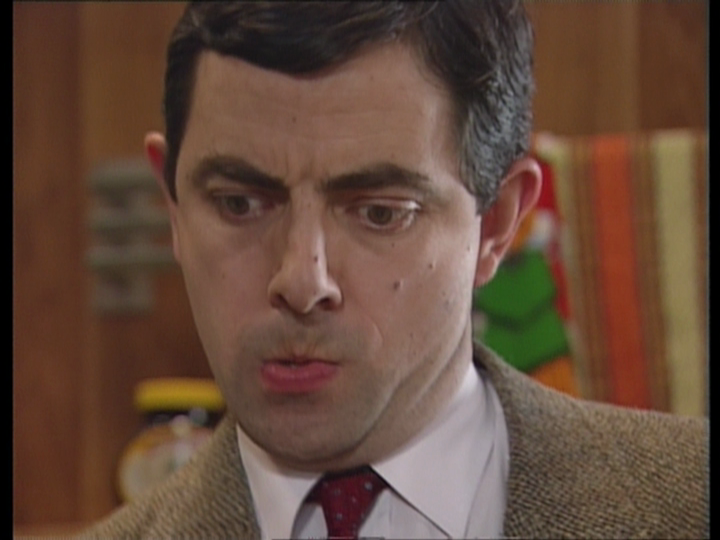 The first major set of Mr. Bean to come out on DVD was from A&E in 2003. It consisted of the 14 episodes and some extras. This release doesn’t deviate from that too much except in a couple of ways. As more and more physical media comes out, it is kind of nice to consolidate packaging. The old set was 3 discs in 3 Amaray cases. This release is a single Amaray case that holds 4 DVDs which makes it nice and compact. The Story of Mr. Bean: This is a special narrated by Helen Atkinson-Wood from 1997 when Bean: The Ultimate Disaster Movie was coming out. 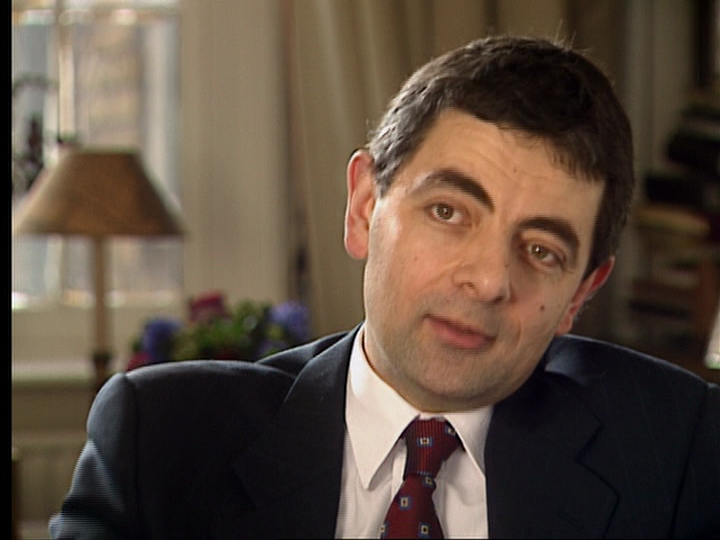 It is a very detailed and enjoyable look at not only Mr. Bean but focusing on the career of Rowan Atkinson. Lots of great archival clips from his time at University, his live shows, Not the Nine O’Clock News, and of course Blackadder. It’s very good stuff. The not seen on TV sketches of The Bus Stop and The Library which are very good. The Best Bits of Mr. Bean which was shown over here on PBS over pledge drive periods to help get people to call in to pledge. 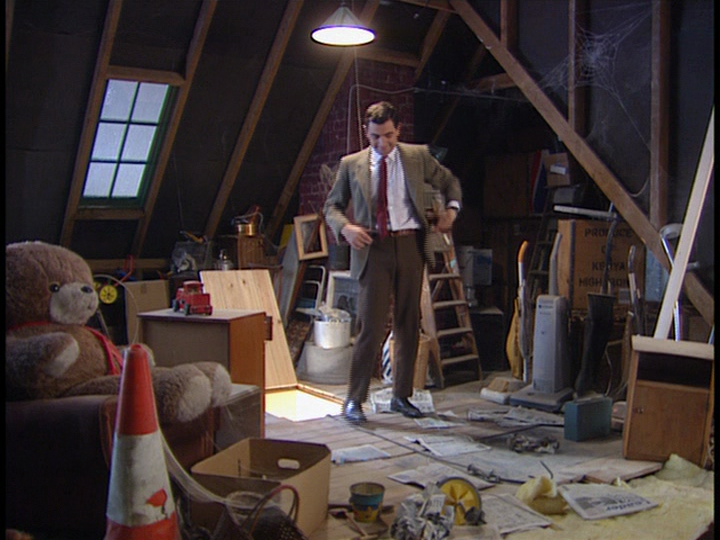 The program was a look back at the series with new linking bits of Mr. Bean in his attic on a rainy day reminiscing. This was not on the 2003 set. 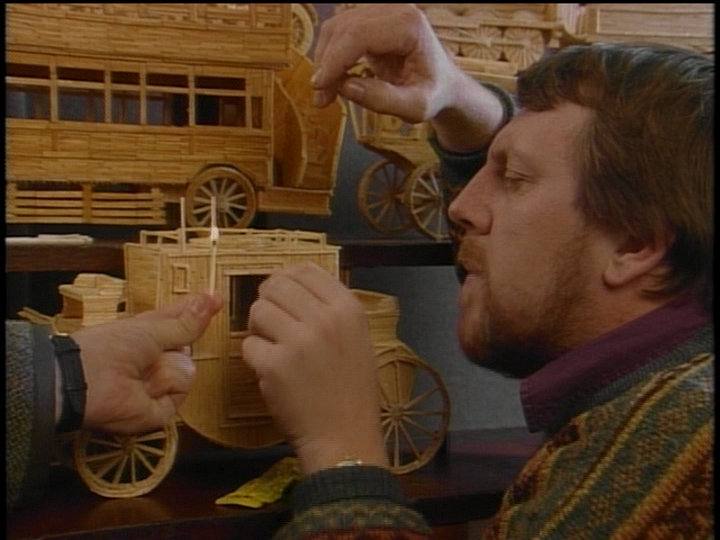 I think this sort of thing is just a nice extra to have and some days I rather watch this than a bunch of episodes. There is also a trailer for the animated Mr. Bean which I have never seen. Have you? Should I give the series a try? It says this is the complete Mr. Bean and while I while I appreciate the sentiment, it is not complete. There are 2 Comic Relief sketches that are not on this set but was on the A&E 2003 set and actually since that set was released, there have been 2 more broadcast, one of them just airing a couple of weeks ago. I am not going to fault this release for not having any of these skits. Comic Relief is its own thing. Sometimes it seems we get stuff from Comic Relief on releases and sometimes we don’t. I think it is tricky to get those rights sorted out plus I don’t know if Fabulous Films even knows about these sketches. Personally to me, it’s not a big deal. Some of the “complete” sets released of this series also included the films. To me, that is a separate thing all together so once again, I am not all that bothered by it. The one aspect I was not happy with in this release is the quality of the 14 episodes. We are told the episodes are re-mastered. Unfortunately, I am finding a trend that re-mastered means something completely different between myself and the studios that release these series. 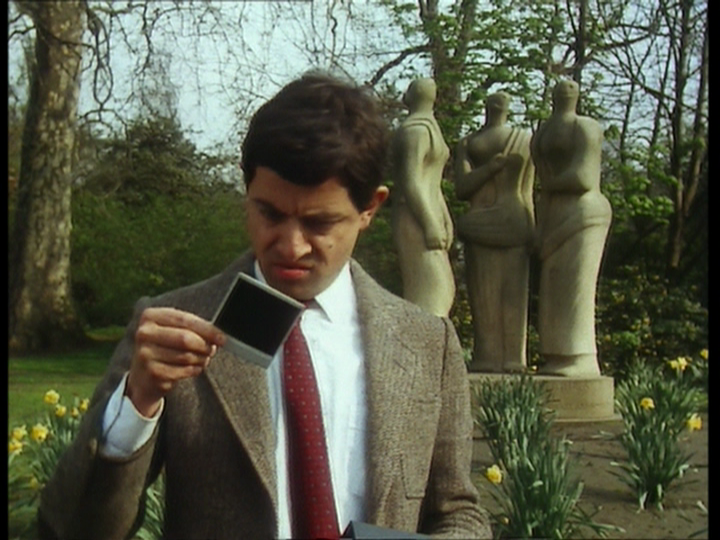 Mr. Bean was shot on videotape with a couple exceptions mentioned above that were shot on film. This release has taken the video and filmized it so the video now looks like a faux film effect. All the lucid movement of video is gone. I have a real issue with this. I want to watch these episodes the way they were intended to be seen and how they were broadcast. The problem is that the film effect on these do not make the series look any better. Some movements are a lot more jagged as fields of video are removed to create this effect. Also, even though it doesn’t look like video anymore, you can see it is from a video source. Stuff shot on video vs. stuff shot on film are lit and paced differently. To me it just looks like something is wrong with the conversions of the episodes. I did a little bit of research and what I think may have happened is that these episodes is how Fabulous Films received them. I doubt they did anything to the episodes. It looks like the last time this series was released in the UK was in 2010. They were called re-mastered on that set and I have a feeling it was done for that release. I think these may be those episodes. This may not bother everyone and I understand that. If you just want to enjoy an incredibly funny and charming series, this release is at a good price and pick it up. Amazon currently has it for about $19 for 4 discs. Unfortunately for myself, apart from the inclusion of those missing scenes, when I watch the episodes, I will have to stick to my 2003 release. I am disappointed by that. If you don’t care about the filmizing of the episodes and just love good comedy, for the value this set is highly recommended. If you are a purist (which I will be the first to admit it can be a disease) I would recommend sticking with a previous release. That being said, those lost scenes are very nice to have. Next Review: I will shortly be posting my first review for a release by the BFI (British Film Institute) and what a way to start! I will be reviewing the upcoming 1960s BBC Sherlock Holmes series starring Douglas Wilmer. This is a Region 2 (UK) release that is not available in the US because a release of these episodes did see a US release 5 years ago. This review will feature screen grabs between the two releases to see the difference in quality.